Bucket Broom - Reach It! - Move It! - Crush It! 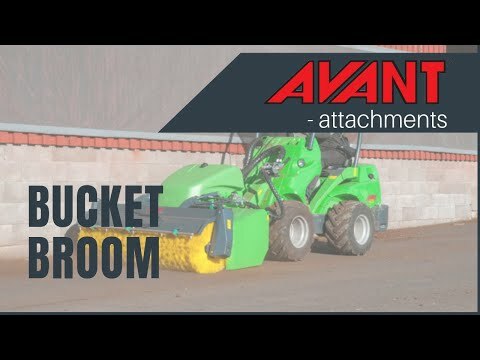 Completely new bucket broom which collects the waste in a large bucket shaped box. The broom gives best sweeping result when reversing, but it also works when driving forward. Forward sweeping is especially recommended when the waste is larger in dimensions, for instance construction waste, beverage cups, tree leaves etc. The bucket broom is equipped with a floating mechanism which allows the bucket lip to rest against ground freely. This means that the loader must not necessarily be equipped with boom floating when working with the bucket broom. Emptying of the collector happens by first lifting the broom up hydraulically, after that the collector box can be emptied by tilting it down like a normal bucket. Brush axle is equipped with a simple quick locking system for adjusting the sweeping height. Water spraying system for dust binding is also available. It minimizes dust build up when brushing dry waste.